A Divvy bike station campus. Aldermen approved a 12-month contract with Divvy at Monday’s City Council meeting. 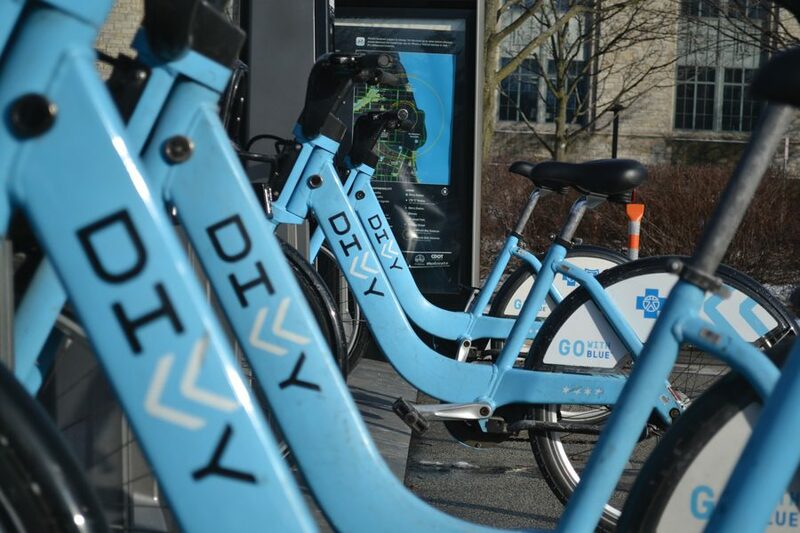 Aldermen approved a 12-month contract extension with the operators of the city’s Divvy bicycle sharing system at Monday’s City Council meeting, establishing additional time to build Evanston-based ridership and other benefits. Aldermen initially made a motion to table the contract extension in City Council for another 30 days, but the motion failed 7-2 with Ald. Cicely Fleming (9th) and Ald. Peter Braithwaite (2nd) dissenting. The motion to approve the contract passed by the same margin. Johanna Leonard, Evanston’s community development director, said the city needs to evaluate data for a year to analyze ridership trends. It is working with Divvy to investigate station relocation options, she added. “We’re getting good feedback from businesses, particularly in business districts, where stations are (about) what they’re seeing anecdotally of patterns of use,” Leonard said. Divvy bikes were introduced into the city in the summer of 2016. The decision to approve the contract follows Oak Park’s decision to cancel their agreement with Divvy, citing low resident membership rates and significant annual losses as a result of the program, according to the Chicago Tribune. In response to concerns about the similarity between the two municipalities, Leonard said Oak Park has not made the same investments in bicycle infrastructure as Evanston. Leonard added that with Evanston’s proximity to Chicago and the bike path that runs along the lakefront, there is a more bike-friendly culture in Evanston. The budget adopted for fiscal year 2018 included over $300,000 allotted for Divvy, according to city documents. Northwestern students also contribute to Divvy bike use in the city, as bike memberships among NU students reached 667 by the end of the 2017 school year, according to a University report released last week. The purple, NU-branded bike — introduced to campus in Fall 2016 — took 821 trips with 640 riders for a total of 1,619 miles, the report said. On the opposing side, Braithwaite said he felt the Divvy contract was a significant investment of taxpayer dollars and that he would like to know more about alternative options. He said he supported the program when it began, but that his opinions have since changed. Fleming said that it was a little late not to move forward with discussions about the contract given the new calendar year, but that she was also concerned about the cost to the city to run Divvy. She said she would be interested in a “pretty aggressive” plan to increase ridership or decrease the number of stations. When several aldermen inquired about the possibility of searching for a partner with dockless bicycles, city manager Wally Bobkiewicz said though it’s important to consider various options, there are currently no plans to move on from Divvy.